Don’t you just want to plan a room around the colors in those leaves on the left side of the mantle? It’s such a beautiful color palette! I also love the way she’s tied in the sweet little gourds, the bird prints, and the books in this mantle arrangement. Simple clear glass vases let the leaves be the stars. A master of tablescapes and shelf arranging, once again Concha has created a beautiful and fun composition here. The grahpics on the posters are crisp, more intricate little works of art are mixed in, stacks of books that could be total pulp (though I do spy some literary classics) add another layer, and a mustachioed rabbit and a fun little car top off the piles of books. It’s so much fun! I also love the way she tucked these leaves behing the sconce. They will cast interesting shadows at night when the lights are on. If you’re struggling with ideas for your Thanksgiving decorations, why not take a look around at the leaves outside, grab a pair of pruners, and swipe a few? For this week’s Flickr fave of the week, I am loving these floating shelves from Jeremy Levine Design. I’m also digging the way they used the stacking shelves on the left side. Thanks for adding it to our Fresh New Spaces Group! By the way, this was an addition and remodel to a residence. The house was built around three trees and includes: grey water recycling, storm water capture, recycled coal fly ash concrete, solar energy, recycled lumber, passive cooling, thermal rock wall, and mobile shade panels. Recently I have the pleasure of sitting down with (O.K., actually emailing back and forth with; this is the era of the Golden Globe winning The Social Network) Adam Fitzgerald, architect and furniture designer extraordinaire. I hope you will find as much inspiration from his work and his advice as I have! mine to sell a line that is creative, but also affordable to most people. priorities when finding a space where you need to be creative? I had a space here in Denver in a building with ten artists that offered a great a chance for feedback and inspiration. Unfortunately the owner sold the building, and we were booted to the street! before I started Jackson Street Furniture. Where do you start when designing something new? A sketch? A wood sample? A dream? every so often. I’ve found that often a sketch from years ago will inspire a new idea when I look at it with fresh eyes. How do you stay inspired? Any advice for those who are suffering from a creative block? something entirely different. That keeps the creative juices flowing—I love being spontaneous with design. when I look at the Open Wide Table. You clearly balance a touch of retro inspiration with your contemporary designs. How do you balance the old and the new? find on fabrics from the 50’s and 60’s. Do you have any words of wisdom for creatives who are ready to make the leap into a building a business? way to do your best work, and give yourself and your ideas the best shot at being successful. Adam, thanks so much for sitting down with us today and sharing your inspirations and advice! To see the Jackson Street Furniture line, click here. I’ve just completed week three (of six) of the organizing workshop. As you can see, my organization efforts are still running behind! I think I was waiting for my space to be perfect before sharing it. Then I realized that I’d be waiting a really long time, put off blog posts, and leave you all with nothing new to read when you stop by for weeks on end. Apparently, waiting until it’s perfect is a paralyzing organizing roadblock for me. I have accomplished sorting various junk drawers and even clearing out a mega-sized drawer to hide my paper and cardboard recycling – the basket full of it out in the open was starting to make me not want to recycle any more! It’s crazy how happy this has made me. The feeling of accomplishment that comes with these little projects is wonderful. You may recognize my map wall. It had seen better days; the sun had faded the once-lovely blue to a depressing gray. Yuck. Actually, it had been replaced by my horrible D.I.Y. disaster inspiration board, but that thing has bitten the dust as well. I cannot seem to find a good inspiration board solution. I need to go re-read my post comments because I know you all gave me some great suggestions. 1) Find the perfect labels for those pails so I’ll know which one to pull down. They contain all of my drafting supplies which were formerly in that little chest of drawers in the BEFORE picture. The chest was great for my station in grad school, but it had just become clunky junky in my current office. I think it would be a cute nightstand in a future dream beach house I don’t own, so I’m storing it in the attic for now. Oh, those are paint tins from Home Depot, I think they cost about $1 each. They come in a bunch of different sizes and they are great for hiding a multitude of sins. 2) Sort whatever the heck is in this tin. 3) I feel like this is sort of wasted space, but I don’t want to fill it just because I have it. Look it how gross it got in the BEFORE shot. For now, I’m going to enjoy the empty space it adds to my flow. Hopefully this wastebasket is not in my feng shui financial corner or something (wasn’t that in Bridget Jones’ Diary? She was basically letting her finances get tossed out with the garbage, according to a feng shui article in one of her glossies. I have much bigger issues to deal with before I can even think about adding feng shui complications!). 4) I just threw extra office supplies on this shelf. I need to get it looking nicer or it’s going to bug me. That Staples box of envelopes is too ugly to be out. These are the kinds of details that bug me. I have to give another shoutout to my Organizing 101 Workshop. It’s part practical organizing, part figuring out the psychology of why my house gets to a certain point of disarray, like why I shop too much, why my clutter builds up, etc.! There’s also a great forum of people going through the same thing to chat and commiserate with – it is really motivating and it’s well worth the $75 price tag. Here are some more beautiful shelves from flickr member hnxing. Check out the way she had the stamps framed. 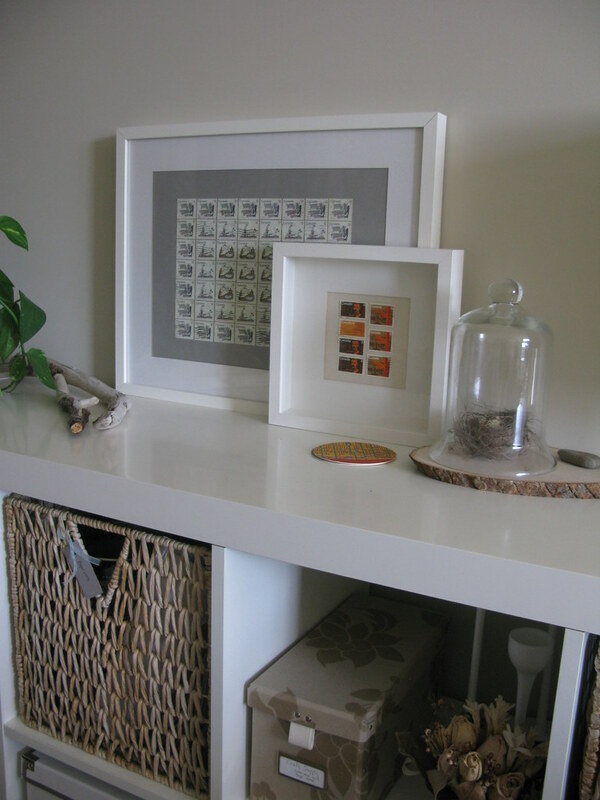 I’ve been meaning to do this with my Eames stamps before I use them all up on bills!